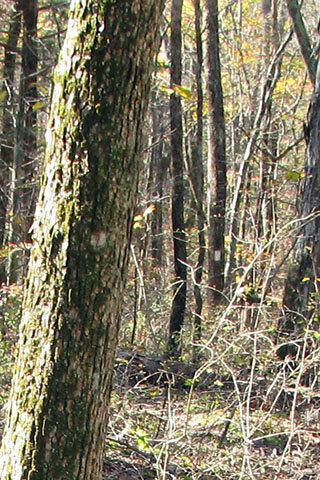 The Adventure Guide to Cedars of Lebanon State Park includes a trail description of the Cedar Forest Trail, photographs of the Cedar Forest Trail, comments from our hikes, mileage data for the Cedar Forest Trail, the custom Park topo map, and Cedar Forest Trail GPS tracklogs. The guide will familiarize you with the Park and help you on your hike. 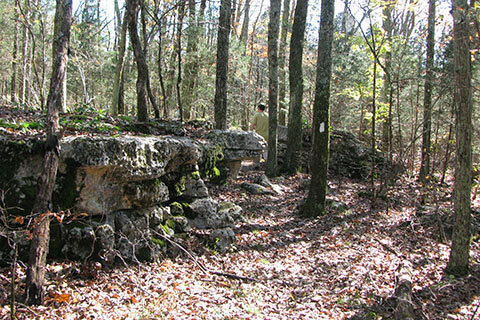 Once in the park, follow Cedar Forest Rd through the park, past the Park Office, then stop at the first parking and picnic areas (.80 miles from Hwy 231). There are restrooms and water at this location. The trail starts on the other side of the road and is well marked. Leaving Cedar Forest Road, the Cedar Forest Trail starts by going up a hill on an old road. After a few hundred feet the trail veers to the left and at .15 miles from the trailhead is a fork. A sign directs hikers to the right, but it could probably be walked in either direction. For .30 miles the trail climbs 100 feet of elevation along the park boundary from which point an encroaching housing development can easily be seen. Leaving the knoll, the trail also leaves the developed area and begins to feel more secluded. After a quarter of a mile, the trail goes by sink holes as it continues to gently descend. Another .45 miles and the trail weaves its way through a great rock garden area. 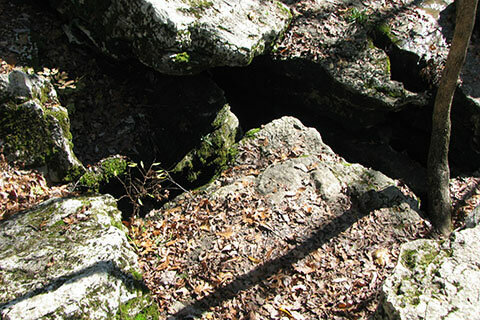 These waist high flat rocks are interlaced with interesting sink holes. The height of the rocks makes it almost perfect for a seated rest. Passing a few more rocks and sink holes, the trail crosses a power line cut and then continues in the woods near the cut. The trail rejoins the fork at .45 miles. The trail then retraces its path down the old road to parking area. While still parked at the trailhead, the Nature Center, Lodge, and a couple of shorter hikes are all within walking distance.